Baked or stuffed, loaded or roasted, in a soup or in a salad! 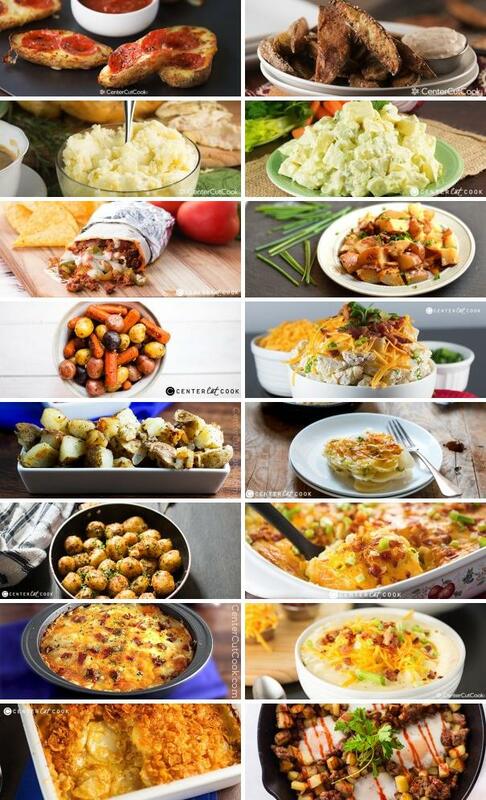 All the best potato recipes are here for you in one place! It’s hard to beat a good potato recipe. The fact that you can simply bake a potato, barely dress it, and have a hearty, filling meal makes them pretty darn close to the perfect food in my book. Besides baking though, potatoes add so much goodness to soups, handle loads of melty cheese, and roast into seasoned wedge perfection. Potatoes turn your plain old eggs into a Cowboy Skillet. They shred into the most delicious breakfast casserole. They mix with creamy dressing into one of my favorite sides: potato salad! I have, of course, included my recipe for the best mashed potatoes, but I have also loaded you up with creative ideas like Pizza Potato Skins, Chorizo and Potato Burritos, and Loaded Baked Potato Nachos. If you are looking to eat on the lighter side, there are several knock-your-socks-off roasted recipes, too! Crisp outside, tender insides, and just the right amount of seasoning. Pizza Potato Skins – A fun take on classic potato skins featuring mozzarella cheese, pepperoni, Italian seasoning with pizza sauce for dipping! Crispy Potato Wedges with Garlic Dipping Sauce – Crispy Baked Potato Wedges are perfectly seasoned then "fried" in the oven and served with garlic dipping sauce on the side. Lighter in calories than traditional fried potato wedges and deeeeelicious! The Best Mashed Potatoes – Everybody has their favorite way of preparing mashed potatoes: with skin, without skin, with milk, without milk, with cream cheese or sour cream. The options are endless! This combination of ingredients in this recipe results in The Best Mashed Potatoes! Classic Potato Salad – Classic Potato Salad made with or without egg. The key ingredient to this potato salad is the Hellmann’s mayo with just a little bit of mustard mixed in. Perfect for potlucks and picnics, this is the Potato Salad recipe you’ll be asked to make over and over! Chorizo, Potato, and Queso Burritos – Spicy chorizo, potatoes, and queso blanco come together to create flavorful, delicious Chorizo, Potato, and Queso Burritos! Slow Cooker Cheddar Bacon Ranch Potatoes – A super simple and fantastically delicious side dish for any night of the week. Throw a few simple ingredients in your slow cooker and have these Cheddar Bacon Ranch Potatoes ready in no time! Garlic Roasted Potatoes and Carrots – These Garlic Roasted Potatoes and Carrots are so easy and delicious – just pop them in the oven to roast and you’re set! Loaded Baked Potato Salad – This Loaded Baked Potato Salad is a fun alternative to classic potato salad. It has everything you love about baked potatoes- It’s made with sour cream, real bacon crumbles, cheddar cheese and chives. It’s best served cold and is the perfect side for summer pot lucks and picnics! This Loaded Baked Potato Salad will soon be a summer staple in your house. Perfect Breakfast Potatoes – These are my go-to breakfast potatoes that turn out perfectly every time! There’s nothing fancy about them, just simple flavorful potatoes that pair perfectly with breakfast! Baked Garlic Scalloped Potatoes – These baked garlic scalloped potatoes are the perfect substitute for over done mashed potatoes on Thanksgiving! Creamy, garlicky, cheesy and with great texture – you’ll be making them long after thanksgiving gets over. Cumin Crusted Baby Potatoes – These quick and easy cumin crusted baby potatoes make for a great alternative to the traditional mashed potatoes. Loaded Baked Potato Casserole – Loaded Baked Potato Casserole with crispy bacon, lots of cheddar cheese and garnished with green onion. The perfect side dish recipe and serves a crowd! Amish Breakfast Casserole – This is not your typical breakfast casserole, it’s quite possibly the Best Breakfast Casserole ever! Made with frozen hash browns or shredded baked potatoes, sausage, bacon and cheese, it’s delicious yet versatile. You can add whatever ingredients that you’d like including spinach or other veggies. Simple, easy, and a great way to start your day! Ultimate Loaded Baked Potato Soup – Ultimate Loaded Baked Potato Soup with tender potato chunks, fresh sharp cheddar cheese, crispy bacon, and green onion for garnish! Cheesy Scalloped Potatoes Gratin – This easy recipe for Cheesy Scalloped Potatoes Gratin, or Au Gratin potatoes is a delicious side your family will love! Easily turn it into a main course by adding ham or bacon. Cowboy Breakfast Skillet – Everything a cowboy would want in a breakfast skillet!